On Saturday, April 29, in the afternoon, State Security agents arrested Roberto Martín Valdivia Hernández, peaceful opponent and President of Partido Democratico 30 de Noviembre (30th November Democratic Party), while he was on his way to the José Martí International Airport from where he wanted to travel to Argentina at the invitation of the Centre for the Opening and Development of Latin America (CADAL). According to his statement, he was taken to a Police unit in the town of Boyero, where his luggage, personal documents, ID card, passport and plane tickets were checked and he was given a warning. 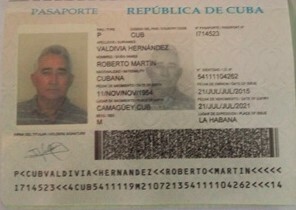 In short, the Police report stated that his presence in Havana posed threat to public order and to the main event on the occasion of May Day. The arrest took several hours and Valvidia Hernández had no chance to board the flight he wanted to take. Finally, they put him in a jeep of the fast-deployment unit as a deportee and took him to one of the checkpoints on the National Highway. There they threatened him, telling him that if he returned to the capital he would end up in prison. The Police then made an arrangement with a driver of a tractor with a harrow, instructing him to take Valvidia Hernández to the town of Jagüey Grande in the Matanzas province, from where he could continue to Ciego de Ávila, where he lives. Despite the fact that State Security made no mention of Valvidia Hernández’s trip to Argentina and tried to justify his arrest and deportation with a potential threat of provocations he could pose to the events on the occasion of May Day, it’s not a secret that this and other similar repressive actions are aimed at preventing members of the peaceful opposition from taking part in international events. Such incidents have been occurring repeatedly in recent weeks, with the tacit (and sometimes complicit) connivance of some democratic governments. Once again, the Castro dictatorship has shown its repressive, discriminatory and intolerant nature, while making it clear what it is capable of in order to retain power.